Are you overwhelmed with the amount of toys your child has? Do you constantly trip or slip on them? Is your child over stimulated? If so, it may be time to tame the toys! A great tip for helping with this issue is to rotate toys. Gather 2 – 3 bins of toys and put them away in a closet or the garage for a couple months. After the two months, pull the 2 -3 bins out and swap them with another 2 – 3 bins full of toys. Your child will be happy to see them again and enjoy playing once again. 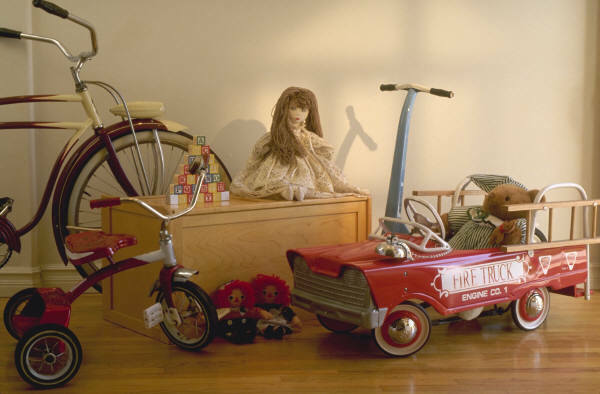 It also helps to control the amount of toys that are kept in the playroom or bedroom, leaving room for each toy to have an assigned space.Make sure to purge toys on a regular basis (once every three to six months). A good time to do this is right before a birthday or Christmas. Get your child involved. Remind your child that together, you will decide what stays and what goes, making room for their new toys. Sort toys into clear bins and make sure to label them. Labels with pictures work well for little ones that can not read. Label shelves, bins, and boxes in a large, clear to read font. Remember to keep like with like and categorize by colors, shapes, and/or sizes. This is a great learning exercise for preschoolers and kindergartners!